Chapel Hill shooting: What's the definition of a hate crime? 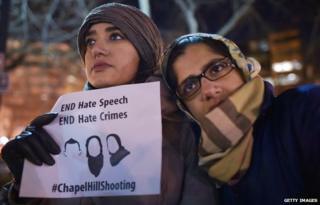 The FBI is investigating whether the fatal shooting of three Muslim students in Chapel Hill, North Carolina, was a hate crime. What is the definition of this offence and how do you prove it, asks Rajini Vaidyanathan. "This has hate crime written all over it," said Mohammad Abu Salha, as he delivered a moving address at the funeral of his two daughters, Yusor and Razan Abu Salha, and his son-in-law, Deah Barakat. Police say the three students were gunned down by their neighbour, Craig Stephen Hicks. An initial investigation indicated Hicks was motivated by an ongoing dispute over parking, and his wife Karen maintains the attacks were not religiously motivated. The FBI defines a hate crime as one with an added element of bias against a person's race, religion, disability, ethnic origin or sexual orientation. The agency says: "Hate itself is not a crime - and the FBI is mindful of protecting freedom of speech and other civil liberties." Proving whether something is a hate crime can be extremely difficult. You have to show that the crime was committed because someone held those views. "If someone from a hate group assassinates the leader of a civil rights organisation, the primary motive is clear," explains Joseph Kennedy, a law professor at the University of North Carolina. The toughest burden is when a defendant may have another motive, but could also hold racial or religious prejudice, a scenario that could apply to the North Carolina case, says Kennedy. "Under federal guidelines you can't prosecute someone for a hate crime just because they have biased views, you have to prove that's the reason they committed the crime." Without a confession, the FBI would look at other evidence to support a motive, explains Kami Chavis Simmons, a former prosecutor for the US government who is now a professor at Wake Forest University. That might mean analysing a suspect's social media posts, checking whether they belonged to any hate groups, and interviewing friends and family. "All of those things could prove a motive, but you're still going to have [to find] a nexus between those things and the crime," Simmons says. What's the law in North Carolina? The vast majority of US states have some form of hate crime legislation, but North Carolina has no specific provision to prosecute murder as a hate crime. The state has an "ethnic intimidation" law which applies to lower level crimes such as assault or vandalism. Hate can be a factor at the sentencing of certain crimes. If someone is convicted of second degree murder, for example, the fact they killed someone on account of the victim's religion could increase the sentence by around three years, explains Kennedy. But first-degree murder, which already carries a punishment of life in prison or the death penalty, isn't affected. Can the US government step in? The FBI is already working with police in Chapel Hill to investigate the killings. But the federal government is "highly unlikely" to push for a separate hate crime prosecution if Hicks is found guilty of murder, according to Brian Levin, a criminology professor who runs the Centre for the Study of Hate and Extremism at California State University. "If a prosecutor can get the death penalty without having to prove the additional motive of racial or religious bias, they will often do that," he says. "It means that some of the most heinous hate crimes in the US haven't been prosecuted under hate crime law." So, what's the purpose of hate crime laws? Although murders only make up a handful of the 6,000 hate crime incidents reported to the FBI in 2013, the category can make a significant difference with lower-level crimes such as cross burning, arson, and hanging nooses. "There are thousands of other hate crimes which may otherwise not receive prison sentences or punishment without the enhancement that hate crime laws provide," says Levin. And hate crime legislation also has a broader role in the criminal justice system, argues Simmons. "There's huge symbolism attached to having these laws on the books," she says. "We want to deter people from committing these crimes and say no one should be targeted because they are from a particular group."